Khalid Moinuddin Hashim, CEO of Precious Shipping (PSL) Bangkok, is an adjunct lecturer at Singapore Management University. He comes from a family engaged in shipping/trade. His father, the late Moinuddin Hashim, was the Chairman of the Indian National Shipowners Association and his late greatgrandfather was a founding director of Scindia Steam Navigation Company. 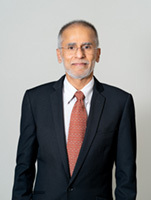 In 1978, after attaining an MBA specializing in Finance, Khalid began his career with Tolani Shipping, Bombay. In 1979, he worked under the late Hon. Ali Maniku, Minister of Shipping for the Maldives Government, in Singapore. In 1984, Khalid joined the GP Group and started PSL in 1989. In 1996 Khalid was elected to the Board of the Swedish Club, a 147 year old Marine Mutual Insurance company; Chairman of the Finance and Audit Committee in 1997, and was elected Deputy Chairman in 2007 and continues with both these positions. In September 2007 Marine Money ranked PSL as the No.1 Listed Shipping Company in the World. In April 2012, Seatrade Asia awarded the 'Lifetime Achievement Award' to Khalid.